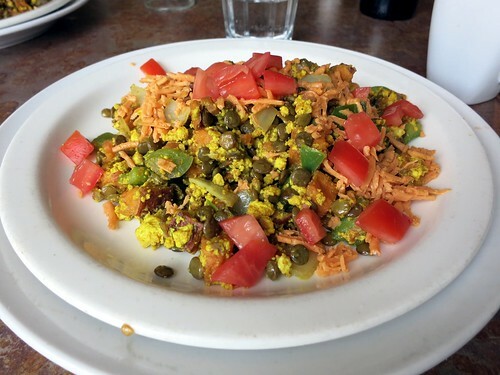 Roadtrip – Vegan Brunch at Merge in Buffalo – vegan in your city. Last weekend we drove down to the USA. Once we crossed the border it seemed like a good time to stop for brunch, as it was shortly before 11 am. When I typed “vegan” into Google maps, it directed us to Merge and we decided to go with it. 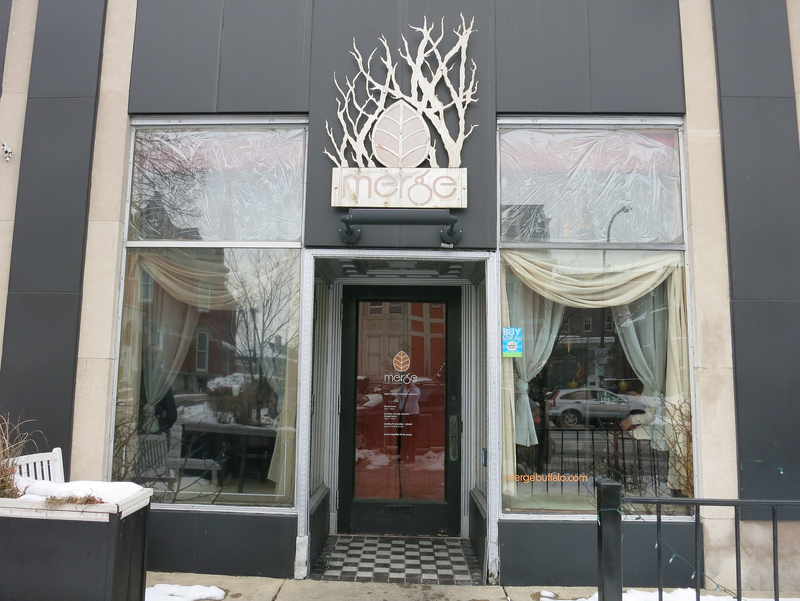 What we found was a beautiful space, tasty food, and friendly servers. Sometimes rolling the dice works out nicely. And we got there just in time, because after 15-30 minutes, the place was full. 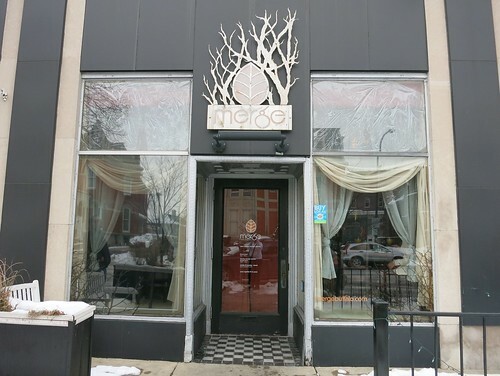 Merge isn’t an exclusively vegan place, as they do serve meat, dairy, and eggs, but they have several vegan options on the menu which are clearly marked with a V. If gluten free is your scene, they also have options marked with GF, but there is not always overlap. 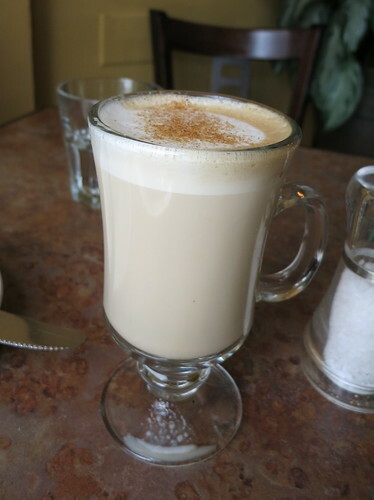 Ordering something that requires some modification, like with non-dairy cheese (or gluten-free) does involve getting charged an extra fee. 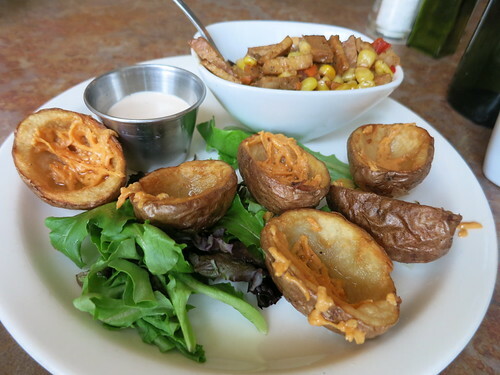 We started with veganized potato skins stuffed with fresh corn salad, tempeh, daiya, and a chipotle cream. Or rather, baked hollowed out baby potatoes, filled with a bit of daiya were sent out, with a bowl of the filling. A DIY potato skin experience – which was something we will have to try at home sometime soon because I really liked it. 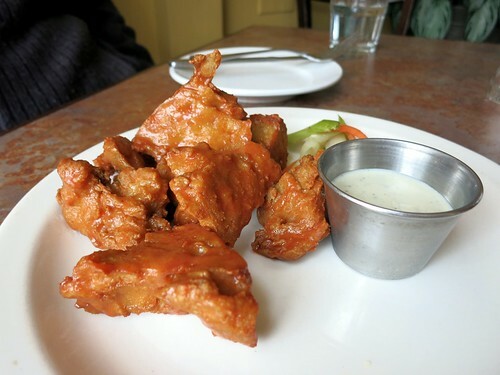 As another appetizer we ordered the seitan wings with hot sauce (they also coming in BBQ) along with a vegan ranch dressing and a couple of carrots/celery sticks. This was very tasty, and I’d order it again for sure, except I’d have one order of the hot, and one order of the BBQ. Yumfest. We decided to skip even thinking about dessert, and get back on the road. Merge was a really positive experience, and a great way to start our visit to the USA.